Traffic remained heavy on the first week that new online health insurances exchanges were open – there were 4.7 million unique visitors to healthcare.gov in its first 24 hours – and many consumers still had to contend with lengthy waits or a variety of technical problems. The law, officially known as the Affordable Care Act, contains an individual mandate that requires Americans and anyone they claim as dependents to obtain health insurance coverage in 2014 or pay a penalty. A Pew Research Center survey in September found that 63% of those who do not have health insurance say they plan to get it within the next six months. However, only about a quarter (26%) of the uninsured said they would be getting insurance because of the law’s requirement. A third said they were planning to get insurance anyway. Almost a third (32%) said they were not planning to purchase insurance. 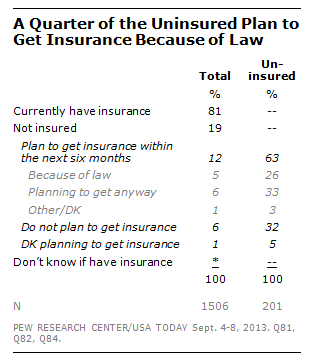 The survey found that uninsured Americans were less likely than the insured to be aware of the mandate. About six-in-ten (61%) of those who do not have health insurance knew that the law requires the uninsured to get insurance. That compares with 71% of those who have health insurance. Just half of the uninsured (50%) are aware that low-income residents in their state will be eligible for federal subsidies.